Preheat oven to 150°C (300°F). Place the sugar and water in a medium saucepan over high heat and stir until the sugar is dissolved. Bring to the boil and cook, without stirring, for 10–12 minutes or until the mixture is dark golden. 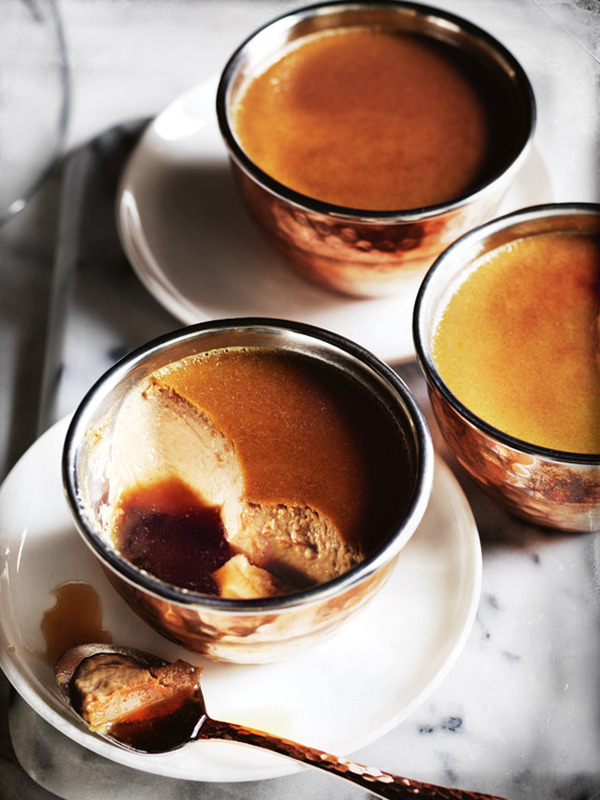 Divide the caramel between 4 x 1½-cup-capacity (375ml) shallow ramekins, swirling to coat the sides. Set aside for 5 minutes or until the caramel has set. Place the coffee, milk and cream in a medium saucepan over medium heat and bring to the boil. Remove from the heat. Place the eggs, extra yolks, extra sugar, coffee liqueur and vanilla in a large bowl and whisk until well combined. Gradually add the milk mixture, whisking to combine. Pour the mixture back into the saucepan and cook over low heat for 2–3 minutes or until the mixture is just warm. Divide the mixture between the ramekins, place in a baking dish and pour enough boiling water into the baking dish to come halfway up the sides of the ramekins. Bake for 30–35 minutes or until just set (they will still have a slight wobble in the centre). Remove the ramekins from the dish and set aside at room temperature to cool completely. Refrigerate for 3–4 hours or until chilled. Serve. Makes 4.